'There's zero emotion and logic in anything about Baaghi 2,' says Sukanya Verma. Having survived the first Baaghi, I sort of knew what's coming. The Baaghi franchise -- there's already a third one in the works -- is all about ex-boyfriends coming to their girl's rescue until it culminates in a tooth-and-nail final battle. Baaghi 2, choreographer turned director Ahmed Khan's junky remake of the Telugu hit Kshanam is no different. Instead of writing a conventional review, I decided to share some thoughts I penned down while watching this supremely senseless movie. 1. Tiger Shroff is a revelation waiting to happen. Only four years and still waiting. Still, if a guy can deliver this much dexterity on autopilot, imagine what he can accomplish under an actual director and competent script? There's an old-school solidity in his hyper-muscular, shirt-tearing, teeth-gnashing, jumping-to-pound fervour. It's unmistakable in his fabulous, fleeting, tribute to Sunny Deol in Ghayal. Tiger's charisma burns the screen and tramples scepticism in favour of a good time. Frustrating how it never goes beyond the promise of potential. 2. By the way, just how many Rambos is Tiger Shroff working on? There is already an official remake in the pipeline. But the star seems so eager to recreate Sylverster Stallone's machine gun-blasting imagery, a good deal of it features in Baaghi 2's bang and boom climax already. Throw in a eyes-above-muddy river moment from Apocalypse Now and King Kong-style music cue and destruction, what have you got? 3. Disha Patni is so remarkably insipid, I can't decide what I am feeling is awe or exasperation. A bowl of gruel could have given a better sense of suffering than what Disha does in this movie. Considering the trauma her character is undergoing, her don't-like-my-photo-on-Aadhaar-card degree of intensity hardly cuts it. 4. The sheer frequency of flashbacks in Baaghi is mind-boggling. Again the hero, by the virtue of being hero, gets multiple flashbacks. Later, the villain gets a flashback; the villain's consort gets a flashback. All I want are my 144 minutes back. 5. Forget how vain Tiger's commando is, I can't stop marvelling at how much of a person's wardrobe a rucksack can take. Army guy Tiger flies straight from Kashmir to Goa carrying this lightweight luggage, but the number of clothes he changes into in a matter of days is truly stupefying. Note to self: Buy one of those rucksack thingies whenever there's a sale next. 6. Whether it's Jackie Shroff using his sister's dupatta to accessorise his look in Tridev, Kajol throwing hers at Rani Mukerji like a blessing in Kuch Kuch Hota Hai or Tiger tying Disha's around his bicep as a keepsake of her memory, the symbolic dupatta in Bollywood movies is always a bandhini pattern. How about some ikat or phulkari next time? 7. Continuity continues to be a sore spot for fictional injuries and bruises. There's a different shade of red on Disha's face and forehead, its location too varies as per make-up man's mood. One cop is punched in the face, a couple of teeth fly off, but return just in time for the next scene. Above all, there's the invincible leading man and and his 'Jo tera torture hai, woh mera warm-up hai' gusto. His bare body is pummelled like some bug-infested mattress. Yet not one scratch appears on that ridiculously sculpted torso. 8. Manoj Bajpayee and Randeep Hooda are smart actors. Not because they've done some great work in Baaghi 2. But because they realise how little this baloney requires. Hooda's hippy, high cop bears an uncanny resemblance to director and actor Amole Gupte. He doesn't look like he cares if you notice. 9. An unremarkable Jacqueline Fernandez dancing to the revolting Ek Do Teen remix is the very definition of poor taste and shabby tribute. Too bad there's no option for fast-forward. 10. One could show up only for the final 20 minutes of the Baaghi movies and still not miss anything. Unless the perfunctory nonsense that precedes it under the pretext of incentive holds any interest to you. There's zero emotion and logic in anything about Baaghi 2. 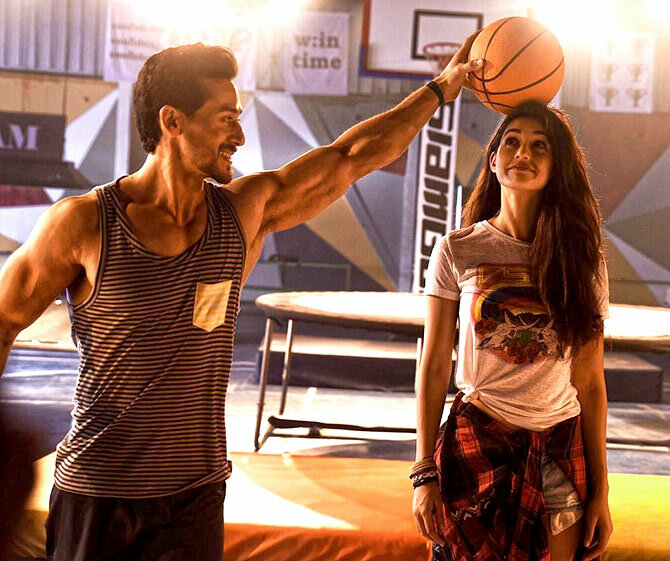 Right from 'Why on earth is Disha's father so opposed to her match with Tiger's to 'this has got to be the stupidest reason for kidnapping ever,' Baaghi 2's laughable twists and slyness are sloppy and forced. Just like that completely needless early sequence inspired by the true incident of an army officer tying a Kashmiri local on jeep. The best thing I can say about Baaghi 2 is it does have its moments of 'so bad it's good' gratification in Prateik Babbar's hammy dope head, the babyish wailing of a constable assisting Hooda and Tiger's bizarre boss, the guy could put caricatures to shame with his 'The war is over' solemnity.